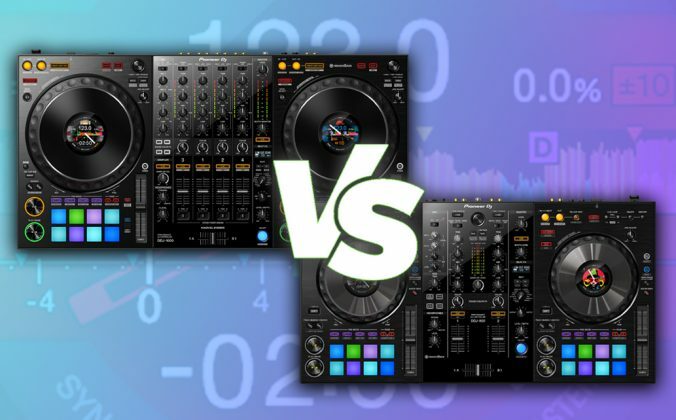 Upfront and exclusive music has always been a big part of the DJ game, and digital music pools aim to give modern DJs that exclusivity… for a price..
Getting your hands on upfront and exclusive material has always been a big part of DJing. 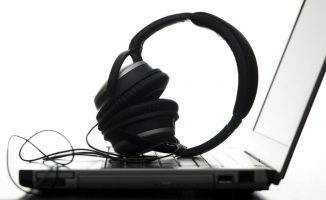 With MP3s and digital music, getting cool stuff first has become harder, and thanks to blogs especially, anything worth having often flashes around the world in as long as it takes to download it. Record pools started in the mid-70s in New York, where influential DJs such as David Mancuso wanted to establish the link between working DJs and the music industry. Meanwhile in the UK, record labels (and later specialised promotions companies employed by the record labels), maintained lists of DJs whom they sent promotional records to for free, again in return for feedback – and for the implied inclusion of their material in the DJ charts that working DJs submitted to weekly music publications. Of course, digital has changed the whole landscape, with far less genuine promotional material around, and with the record labels steadily losing their grip on music releases in general as music is distributed in different (online) ways. 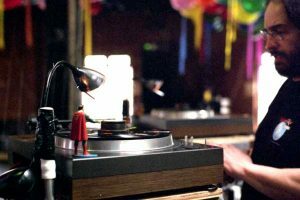 New York disco DJ pioneer David Mancuso started one of the first DJ record pools – but things are very different nowadays. Today, modern music pools let you download MP3s rather than mailing you vinyl or CDs (although the latter still exist). 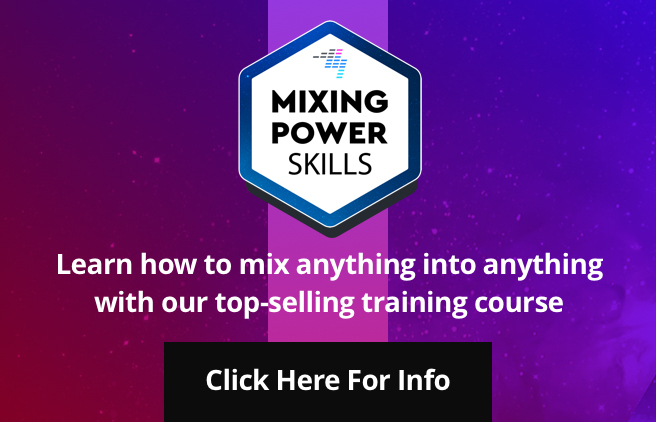 Many still present the pretence of serving working DJs with promotional music, but most don’t as a rule run any checks on whether you’re a working DJ or not (you just say you are when you sign up – and pay). 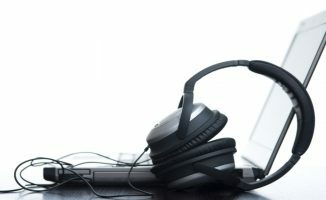 That said, there are still exclusive tracks to be had (the best pools know that if they commission remixes and offer value-added DJ services, they have an edge), and if you are a working DJ and need hassle-free, dependable access to upfront material on a regular basis, music pools certainly can help. 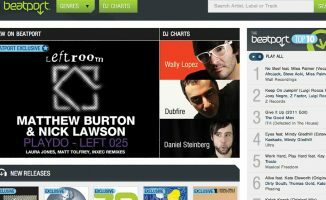 Part of the game nowadays is improving the experience for DJs looking for music. Buying online can be great but it can be painfully tedious, and having a music pool that offers you the support, tracks, quality and exclusivity you need to actually enjoy filling your virtual crates every week is an alluring prospect. These are interesting times, though, because new services that didn’t grow out of the old vinyl and CD pools are offering subscription downloads to consumers direct, so DJ record pools have to up their game further by offering more and more DJ-friendly services to their subscribers. As usual, outstanding customer service will make the difference. At the end of this article is a list of music pools that you can explore, but meanwhile, lets look at the things you should be looking for when choosing a music pool to try. What’s exclusive? Are they offering you acappellas to help you spice up your DJ sets? 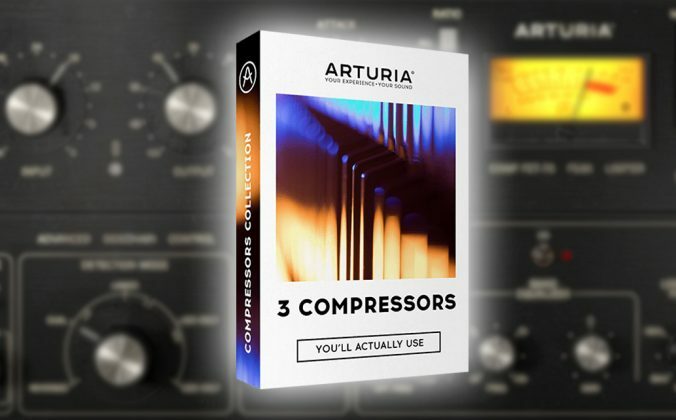 Pop with beat intros and outros to help your mixing? Exclusive remixes and mash-ups? Instrumentals? Clean/dirty versions? Proper file tagging? What are they giving you that will help your DJ sets stand out? 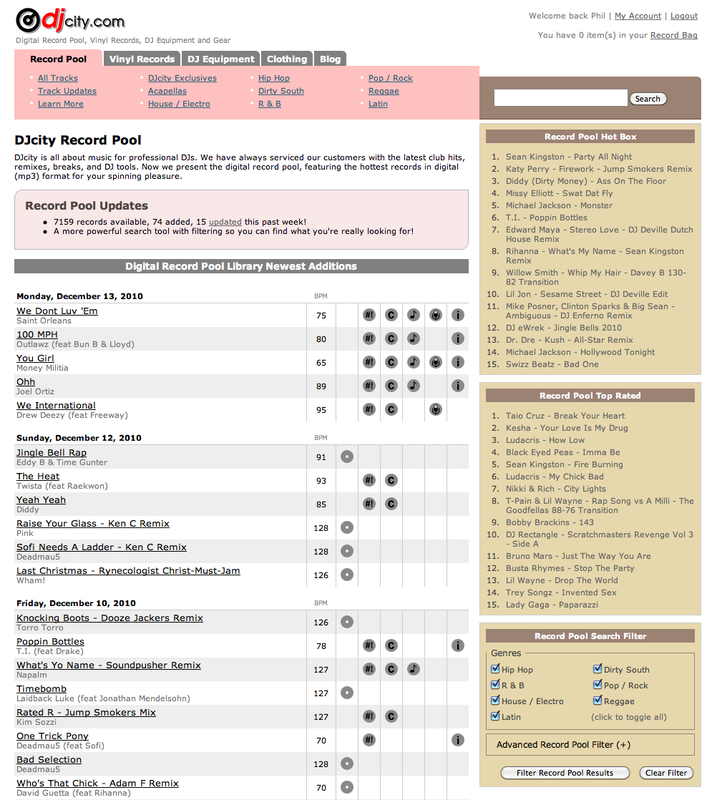 DJ City: A good example of a well-run music pool’s home page (click to enlarge). What are music pools actually like? 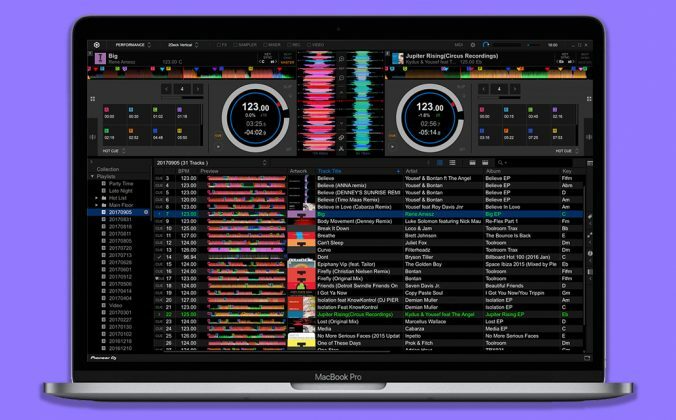 To show you what it’s like to use a music pool, we’ll talk you through one of the more popular ones, DJ City (Disclaimer: DJ City advertises with Digital DJ Tips). DJ City is a Top 40, electro-house and hip-hop centred record pool, and it’s pretty typical of the better record pools out there. Here’s the DJ City home page (click the image to enlarge it). You can see a list of new arrivals by day, taking up the main part of the screen. The symbols tell you whether the track is dirty or clean, whether instrumental, acappella and intro version are available, and the BPM. Typically you’ll get the ability to search and to filter your searches too – here you can do it by genre, BPM, sort by date, A-Z and so on, and usefully also look at exclusives from the pool to see what you can get that maybe other DJs in your city who don’t subscribe haven’t got. Here’s where you choose your versions and give a short reaction for the record label or producer before downloading (click to enlarge)..
Click on a release and you move to a preview page where you can hear the track and also see what versions are available for you to download (see the second screenshot for an example of this). 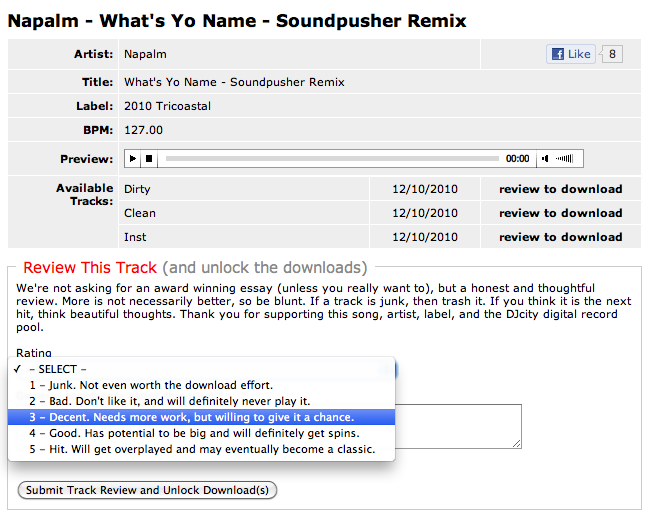 DJ City asks you to feed back your comments to the label/producer, and once you’ve done that, you can download the versions you want. In a nutshell, that’s how record pools work. Note there was no credit card bit – in fact, it would be fair to say that good music pools make the whole experience like record shopping at the consumer MP3 stores, but stripped back to the essentials, and with added DJ features. OK… so I may want to join one. Here are a few record pools you may wish to consider from the many that are out there. You’ll pay from $10 to $60 or more a month for the privilege. 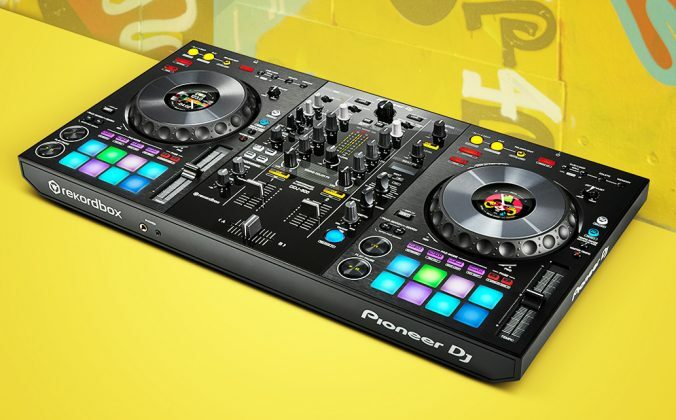 If you DJ regularly and get paid for it, there will almost certainly be a record pool out there that can help you. 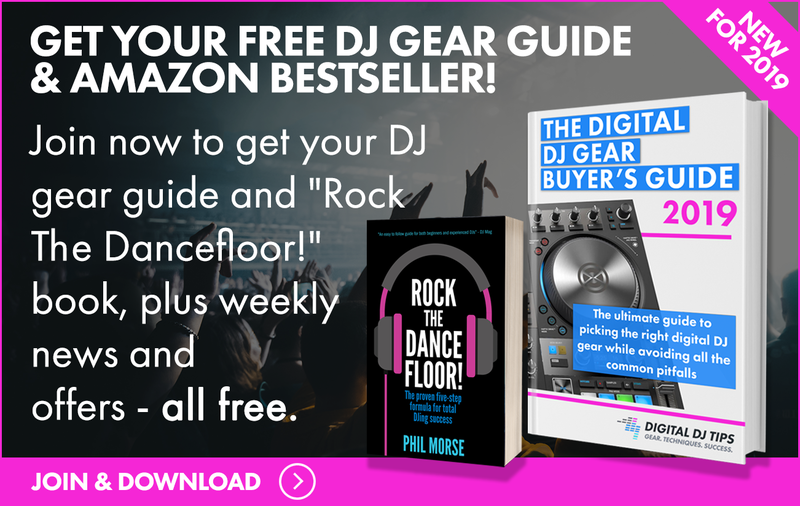 The bottom line is that if you DJ regularly and get paid for it, you play a certain style of music, and spend much of your time online looking for that music, there will almost certainly be a record pool out there that can help you to spend less time and get better music in your sets. DJ City – Nice interface, good quality files, mainly pop with some house/electro, hip hop and even a bit of Latin. Lots of exclusive remixes, growing fast. 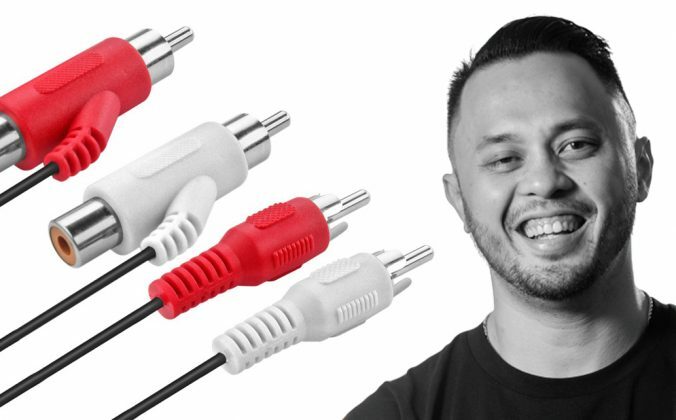 Digiwaxx – Long-established, popular and busy urban (read: hip hop) DJ pool. Masspool Digital – Respected and popular DJ pool with a wide choice of music. Well respected within the industry. zipDJ – Wide choice of music across several genrres. Good reports from DJs on this one. Late night Record Pool – Professional pool offering video as well as audio. My Promo Pool – Extensive choice of electronic dance music, one of the few pools specialising in this type of music. ERG Music – Mainstream promo pool offering videos and karaoke alongside the usual pop-fare and on-subscription services. iDJ Pool – This might be MP3 but its true old school – you simply download a directory of tunes to preview offline. Wide choice. Direct Music Service – Distinctive and clearly professional-led service with a large number of edits and mash-ups. Have you joined any of the pools? 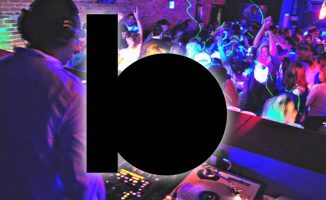 Are you looking to join a DJ pool? Let us know your experiences in the comments. how do things stand on licensing for these files, do you require permission to play them out? are they part of the produb thing or are they exempt as by definition they are provided for you to play out? My understanding of the UK Produb licence is that it applies if you transfer legally-owned media to a different format. The idea being you don’t own the music itself, just the medium it was given to you in. So if you digitise a CD you bought to play as an MP3 in a club, you need the Produb licence. 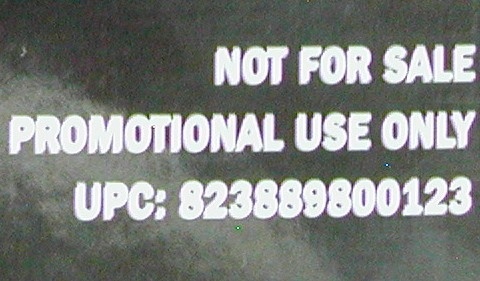 As these are legally obtained MP3s, and you’re simply playing them, I don’t think Produb applies. I have a contact at Produb so I will ask them to come and have a look and give some feedback. How do you prove that you’re a working DJ? Like what if I’d like to start spinning some tunes for people at house parties? Would you be considered a working DJ if you get paid? Or what if you’re trying to get out of the bedroom and into a club booth? Would you need proof that you’re going to be a working DJ? Great article. I always heard about record pools but never really understood how exactly they worked. This may be a stupid question but if you have a DJ pool subscription and download the audio can you record your mixes or are the files DRM protected like the content unlimited subscription with virtual DJ? You can use them as any other “normal” music file. To Tony: Your post has actually inspired this post: 3 Simple Steps To A Great Digital Record Collection. I tried to deal with closed-mindedness on dance floors at the same time, but I think I’ll save that to another post. “my free time is limited at best so I will gladly let them do it.” – Again, record pools come down to saving busy DJs precious time. How does one submit records TO dj pools? I’m not s big DJ I do local party’s, wedding, and special events. I have been using Rhapsody now Napster for years, yes I have a lot of music that I use. 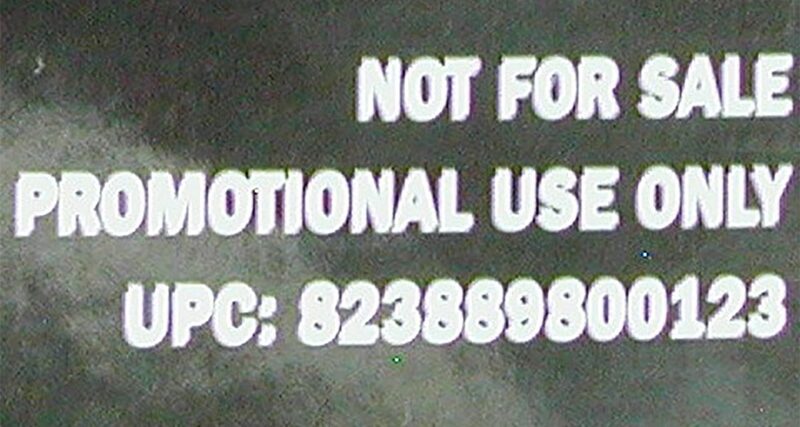 But I have purchased a new software for my computer call PC DJ, and Napster will not allow me to use the music with this program. So I’m looking to get a lot of Old school music for example Blues, modern blues, country, old school rap and new, and trap music. But I don’t know if a DJ Pool will work for me. Just seeking advice. DJ pools are best for modern music. We recommend looking for genre-specific compilation albums on iTunes etc for collecting “old” music.